I listened to this book months ago, but you know how I have that backlog in reviewing books? Yeah, this is one of them. 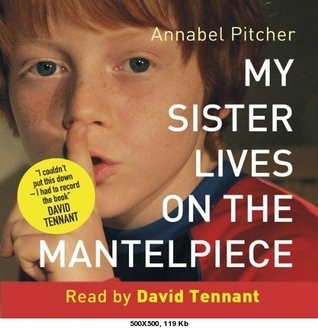 My Sister Lives on the Mantelpiece is the story of ten-year-old Jamie as he tries to live in the aftermath of his older sister, Rose, dying in a terrorist attack. It has been five years since Rose died and Jamie could hardly remember her, but he could see the effect that this had on his family. This novel deals about loss, grief, hate, family and religion, all told in the eyes of a ten-year-old boy. It was a pleasure listening to this book, not only because it was narrated by David Tennant, but because it was actually quite charming despite the serious topics it dealt with. The main character, Jamie, reminded me a bit of Auggie from Wonder, and I was immediately drawn to his story. Somehow, this gave the book a more honest point of view, and it gives us a different insight on grieving, especially for someone who you barely know but you should still grieve for. I really liked Sunya, Jamie’s Muslim friend, too. I liked how smart and resilient and friendly she was, and how she changed Jamie’s perception of something that his father really hated and blamed for the loss of Rose. Jamie and Sunya’s friendship was cute and funny and heartwarming, and that little hint of a young romance was done quite well. But more than this friendship, I really liked Jamie’s relationship with his older sister, Jasmine. In a way, Jas lost more than anyone did, because Rose is her twin sister. Their sibling relationship made my heart hurt several times, and I liked how protective Jas was of Jamie even to the point of keeping something from him so he won’t get hurt.